Ramanagara District: Is it Hiriya Kempegowda's grave? Is it Hiriya Kempegowda's grave? Very recently at Kempapura village in Magadi Taluk, a tomb said to be of Magadi Kempegowda was discovered. Few historians and archaeologists who visited the spot have opined it as the tomb of Hiriya Kempegowda the founder of Bengaluru. But a convincing confirmation has not been officially announced by the Government yet. The Kannada inscription on the tomb says it is that of Hiriya Kempegowda or Kempegowda I who died at the spot after a quarrel (jagala in kannada) while returning from Kunigal. Despite much information about Kempegowda I and his contribution to the growth of Bengaluru, historians were unable to locate his tomb till now. 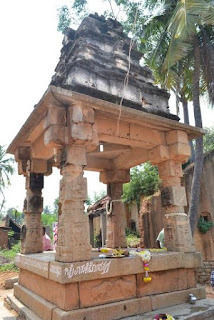 The tomb was accidentally found by one Mr.Prashanth Marur when he visited Kempapura village. The tomb was covered with shrubs and weeds, but its resemblance with the Kempegowda Towers at Bengaluru drew his attention. 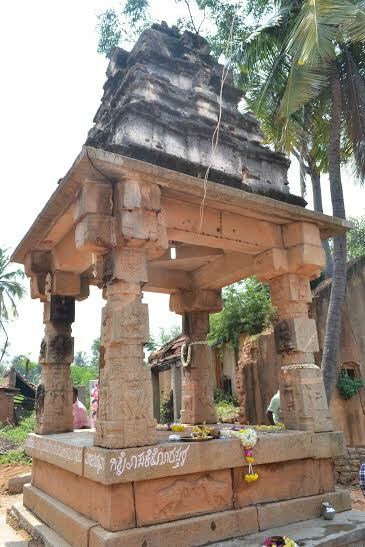 Till then no one had any clue about the historical importance of the tomb, though the few senior citizens in the village say that their grand parents had told them that the tomb was of Magadi Kempegowda. Historians who visited the spot have confirmed the script in the inscription date backs to the period of Hiriya Kempegowda but a thorough and detailed research is needed they have said. If the tomb is confirmed to be that of Kempegowda the founder of Bengaluru, the Government of Karanataka and Bengaluru Mahanagara Palike (BBMP) should jointly take a up a project to develop it as a memorial for the builder of Bengaluru. 8 trees axed for silly reasons!